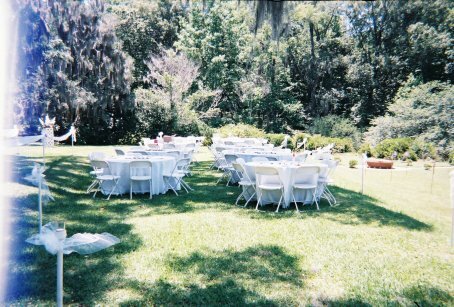 If your looking for a simple second wedding, without all the hoopla and expense, it's a cinch to pull off with some thought and planning. The bride getting married for the first time may want to have everything traditional. After all, she has been dreaming of her wedding day her whole life. Whereas a bride that has been married before may want to keep things short, sweet, and simple. Perhaps the same is true of the groom. This may be his first marriage even though the bride has been married before. If so, the first time groom has every right to want his special day to be a memorable one. It can be short, sweet and simple and still have the detail that he thinks will make it special for him. When the wedding is for two people who have been married before, it is very tasteful to have a semi-formal or casual ceremony. The simple second wedding can be held in any place that a first time wedding would be held, whether it be church, home, garden or any other venue of the couple's choosing. The second wedding, or third, or whatever, has a few unique variables that a first time wedding does not have. One of those factors is children. When planning, be sure to include the children. The last thing you would want is for the children to feel alienated by the new comer. You might want to include them in the wedding invitation wording. Maybe ask them to be part of the bridal party....even a stand-in best man or maid of honor if they're too young to be the real deal. Another factor is the requirements that may have to be met for the remarriage of a divorced person. This is especially true if you intend to use a church for the wedding. The officiant will be a good place to start asking questions. At one time the bride being married for a second time would not wear white, but today any color wedding dress is more than acceptable. The veil is a symbol of virginity and so etiquette dictates that it should not be worn. Another headpiece would be fine though. But hey, rules are made to be broken, so be true to yourself! Resorts like the one below offer packages that are very reasonable for the wedding and the honeymoon. Not only do they offer a reasonable price, they do most, if not all, the planning for you. Check them out. A simple second wedding is the key to keeping the ceremony affordable. Many couples will, by this time, have lots of more demands on their finances and so planning your wedding for less is the way to go.